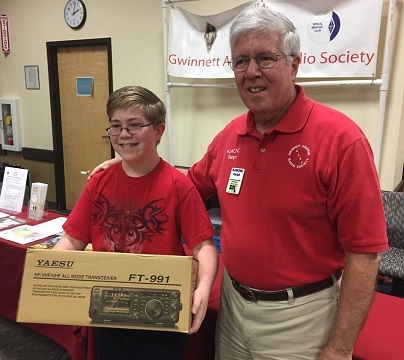 For TechFest 2017, we are raffling off a brand new HF, VHF, UHF radio. Details: FT-991 ALL-BAND, MULTIMODE PORTABLE TRANSCIEVERThe FT-991 is the next generation in all mode, all band MF/HF/VHF/UHF transceiver with C4FM (System Fusion) Digital capability. The FT-991 includes multi-mode operation on CW, AM, FM, SSB, and Digital Modes (Packet, PSK31, RTTY and C4FM), with 100 Watts of HF/50mhz Capability (50 Watts VHF/UHF). The New FT-991 now includes a high-resolution full color 3.5″ TFT Touch panel for superior operability and visibility, incorporating a High Speed Spectrum scope with ASC (Automatic Spectrum-scope control) built right in.The FT-991 is designed for the most competitive operating situations, with a suite of new features to enhance the experience. Whether you primarily operate at home, mobile or in the field, the FT-991 will provide outstanding fundamental performance plus give you easy access to the full range of exciting modes available on the ham bands today. Tickets are $5.00 each, or 5 tickets for $20.00. Tickets will be available for sale at TechFest. GARS representatives will also try to visit area clubs with raffle tickets for sale. We added an online ticket order option. Orders may be made online. Feature to be open soon. Order Raffle Tickets Here – Multiples of 5 for $20.00 only. The drawing will be held near 2:00pm at the GARS table. You don’t have to be present to win the raffle.